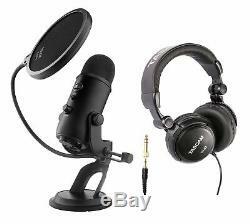 Blue Microphone Yeti USB Microphone (Blackout) with Headphones and Pop Filter. Brand New in Original Packaging. Blue Microphones Yeti Microphone (Blackout) with Assassin's Creed Odyssey Game. Knox Gear Pop Filter for Yeti Microphones. 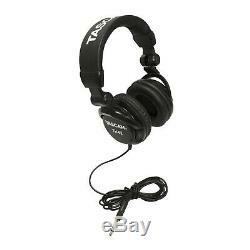 Tascam TH-03 Closed Back Headphone (Black). 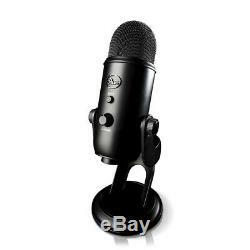 Blue Yeti USB Microphone (Blackout). Knox Pop Filter for Yeti Microphone. Blue has teamed up with Ubisoft to bring you the Yeti with Assassins Creed Odyssey Bundle. Yeti is the gaming industrys #1 premium USB microphone that delivers unparalleled depth and clarity to your Twitch streams and in-game communication. Together with the highly anticipated action-adventure game Assassins Creed Odyssey (PC download), this bundle gives you everything you need to game and sound like a pro. Total Recording Control with Yeti. Yeti features studio controls for headphone volume, pattern selection, instant mute and microphone gainputting you in charge of every level of the recording process. If youre experiencing distortion or feedback while recording an especially loud sourcelike the deafening sound of an avalanchesimply adjust the microphone's sensitivity with the gain control. Or if you want to take a break in the middle of a podcast, use the instant mute button. The microphone comes equipped with a 3.5-millimeter headphone jack that allows you to listen to what you're recording in real-time, without latency delaysthat means no more hearing a note 3 seconds after you played it. You can adjust the volume of your headphones using the control on the front of the microphone. Innovative Design Makes Recording Easy. Yeti doesnt mind getting pushed aroundit lets you adjust and pivot the microphone in relation to the sound source, which optimizes your sound quality. Once youve achieved the desired angle, simply hand-tighten the set knobs to secure it in place. Yeti is a side-address microphone, so you can capture the best sound by going face-to-face with it. The microphone can also be folded down for easy portability, or removed completely from its base for mounting directly on a mic stand or Radius II shockmount. Simply plug Yeti into your computer's USB port with the included USB cable, calibrate it with your operating system, and you're ready to recordrain, shine or snow. Yeti offers driver-free operation, while the Yeti Pro requires easy-to-install drivers, available from Blue. Who needs a learning curve? Yeti was designed with a convenient, no-hassle workflow in mind. Set up in seconds with the included desktop stand or connect directly to a mic stand. And record in comfort with Yetis side-address operation. Four Different Pattern Modes for Versatile Recording. Stereo Mode - The stereo mode uses both the left and right channels, and is ideal for capturing a realistic, general sound image. 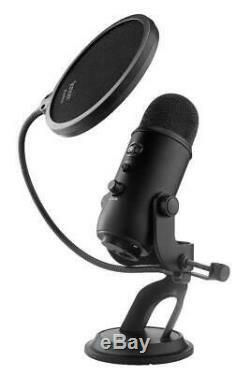 Cardioid Mode - Well-suited for podcasts, vocals, or game streaming, cardioid mode records sound sources that are directly in front of the microphone. It delivers a rich, full-bodied sound. Omnidirectional Mode - Omnidirectional mode picks up sound equally from all directions. Its best used in situations when you want to capture the ambience of'being there'like a live recording of a band's performance. Bidirectional Mode - Bidirectional mode records from both the front and the rear of the microphone. Its ideal for capturing the nuance of a musical instrument, or recording an interview between two people. Assassin's Creed Odyssey: PC Download. Write your own epic odyssey and become a legendary Spartan hero with Assassins Creed Odyssey. Forge your destiny in a world on the brink of tearing itself apart. Influence how history unfolds in an ever-changing world shaped by your choices. The ultimate professional USB microphone. Great for gaming, podcasting, vocals, instruments and more. Tri-capsule technology and 4 polar pattern settings. Gain control, mute button, zero-latency headphone output. Easy Plug'n Play set up - Mac and PC compatible. Unique pivoting design - Desktop or mounted use. Assassin's Creed Odyssey activation code (PC digital standard edition). The Knox Gear Pop Filter for Yeti Microphones is a guard used by amateurs and professionals to achieve clearer audio recordings by eliminating'popping' sounds from P's and B's. It also keeps saliva from hitting the microphone. The included gooseneck clamp enables the filter to be placed in a variety of positions. An Inexpensive Way to Improve Audio Quality. Whether you're a professional or amateur, adding a pop screen to your recording set up is a cheap and easy way to improve the audio quality of your recordings immediately. Pop screens diffuse wind and gusts of air expelled from your mouth when you speak to help eliminate the loud thuds that can occur when air hits the microphone. Eliminating these noises makes your recorded audio sound clearer and more professional to listeners! Designed Specifically for Yeti Microphones. This pop screen is specially designed for use with the Blue Microphones Yeti. The Yeti's base is a non-standard design so traditional pop guard clamps can be difficult to attach to it. The clamp for this pop guard is flat instead of curved so it will sit directly against the Yeti's stand. Padding on both surfaces of the clamp protects your microphone from scratches and damage. The pop screen is mounted on a flexible gooseneck arm that allows you to position it however you want. For extra support and stability during recording, the arm can be bent around the stand and mic. The arm is roughly 14 long so you can position the screen as close or as far away from the mic's surface as you'd like. The screen is 6 in diameter and will diffuse bursts of air even if the source isn't directly in front of the microphone. This means you can conduct interviews with people who are sitting next to you without worrying about either of you causing pops or thuds. The large screen will also protect your Yeti microphone from saliva that might be expelled from your mouth as you talk. 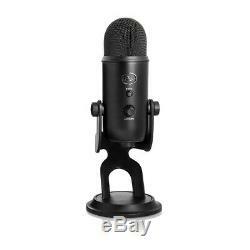 Specifically designed to be compatible with the Blue Yeti microphone. Also compatible with desktop (free standing) microphones. 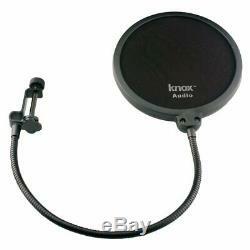 Knox Gear Pop Filter for Yeti Microphone. The Tascam TH-03 Studio Headphone provide tremendous sound and stylish comfort with its tightly-stitched, padded headband & closed back design. Ideal for professionals in the studio or the frequent traveler, this ultra-portable, foldable headphone is also highlighted by left and right ear pads that offer great flexibility via full 90 rotation. The high-quality components deliver clear balanced sound to all of your favorite tunes, regardless of genre. No matter where you go, you can always take the amazing, professional sound quality of Tascam with you. Adjustable arms for maximum comfort. Foldable design for easy storage & transport. Super soft padded headband & ear cuffs for extended use. Closed Back construction for optimal noise isolation. 1/8 to 1/4 adapter included for increased audio device compatibility. Snap-on 1/8" to 1/4" adapter. F There are product categories which are not returnable due to hygienic or sanitary as required by manufacturers. In an event where there is an error regarding a price error or description, we will notify you ASAP. Items removed from their'blister-pack' display packaging are non-refundable. The item "Blue Microphones Yeti USB Blackout Edition & Assassin's Creed Headphone Bundle" is in sale since Monday, April 4, 2016. This item is in the category "Musical Instruments & Gear\Pro Audio Equipment\Microphones & Wireless Systems".